I could watch only the last few games because of an enormous crowd at the ticket office and a bug in the system which was slowing down the whole process. Anyway Cornet looked very far from focused and the low crowd all behind the local rising player didn't help her finding the calm to limit Burnett's firepower and force her to hit a lot of balls before winning the point. It wasn't so, Nastassja had much of an easy day, all her shots were working well and she was solid with both forehand and backhand, dictating the pace of the rally and so being always on the lead. The Italian had no problem closing the match, despite playing a bad game on 5-1 on Cornet's serve, she served well on the next game and closed under a waterfall of clapping. I was able to follow this match because court 1 and two share parts of the stands and so while watching Oudin's match, I could spy the next court and enjoy some rallies. In the first set what one might have expected to happen seemed indeed to happen, but in a completely unexpected way. What do I mean? Well, Johansson was playing the exact match I expected Muguruza to, she served and raturned hard and deep, dictating the rallies with powerful shots, forcing Garbine to run and hit out of her comfort zone. I have to admit I was really surprised by the power and accuracy of Johansson, who had no problems in taking a first set lead of 5-0, while the Spanish youngster looked tight and lost on court. Something changed in the last games of the set, Johansson slowed down her shots and from then on she barely ever could trouble the Spanish, who started to gain confidence and could rely on a lot more errors coming from her opponent. But if the first set could still somehow end in the French player's favor, the second set was as fast as the first, but the other way round. Suddenly it was Muguruza looking flawless and Johansson lost and the rage that soon took control of the French player didn't help her out of the hole, rather killed her last chances to win the match. Garbine now could count on much easier balls to attack and most of the times Johansson tried to be more aggressive she ended up missing. On 2-0 down in the third Mathilde tried a desperate attempt to get back, but the close game lost definitely killed her last chances. [Q] M Oudin (USA) b. E Makarova (RUS) 26 75 4-2 rit. By far one of the most interesting matches I was witnessed to watch. The two girls played some spectacular tennis all through the match and the quite big crowd watching totally enjoyed it. I reached the court to see Makarova serving for the first set 5-2 up, but you could tell that she wasn't in complete control of the match. The great form showed in Madrid just few days before was still there, but the slower conditions weren't helping her, while on the other hand Oudin looked the best I've ever seen her on the dirt. Melanie was running much and retrieving many balls back with depth and often with power, so that Makarova could hardly ever charge for easy shots at the net. Serving for the set Makarova found herself down of two break points after a couple of great defensive shots of the American that found the Russian out of position. Nonetheless Makarova could find a streak of great shots and with a big winner and loud scream she closed to set at her very first chance. The first games of the second set seemed to lead towards an easy match for the Russian as Oudin looked little tired and frustrated too, after the missed chance to re-open the set. Her balls were too mild and Makarova couldn't ask for anything better, she stepped inside the court and hit many winners to take the lead. humility started to make Makarova feel her presence on court: her ball suddenly found power and depth, there was no ball too far to be reached or too powerful to be handled. With two impressive backhand winners in a row she could get the break back and from 2-2 the match found an incredible new quality and intensity. Both girls wanted badly to win and you could tell by the screams and grunts, the efforts and the "come on's" on winners that made the crowd go wild. Makarova started to look tight and called the trainer on court complaining about all the balls that was defending, but the trainer didn't sort the effect she hoped for as she got broken and Oudin could serve for the second set. Melanie was a little unlucky then, as she took the initiative and three times in a row she missed backhands that would have been winners and after having wasted 3 set points she was back to tie on 5 games each. The wasted chance could have hurt her mentally, but she could see Makarova feeling insecure and instead of surrendering, she kept being aggressive and mixing up her game with deadly slices. The combination often took Makarova out of her comfort zone and many times Oudin found the space for a winner, that happened on 6-5 up as with two outstanding winners she closed the set. The burst of power used to close the set probably took its toll on the American that again started the set below her level, so that Makarova could take a 2 games lead, but once more Melanie fought back and by exploiting her winning tactic to the best, she suddenly re-found the form of the late second set and won four games in row, while Ekaterina seemed to grow tired of fighting and running for every point. On 4-2 Oudin went to serve, when Makarova called for the physiotherapist, she didn't seem particularly on pain, but the tiring week of Madrid and the 2 hours on court against Oudin probably took their toll on her shoulder and she preferred to retire instead of getting injured before the French Open, mostly because she seemed in no position to win at this point. It felt like a great win even for the American, who needed this one for her motivation and she looked overjoyed while signing autographs at the end. I could watch this match only from the middle of the first set, but there wasn't much to be said about it. Jelena looked a little rusty at the very beginning and couldn't find the time off the weird shots of Pironkova, who tried to mix her game with spin and slices, but soon started to be too inconsistent to trouble Jankovic. The Serb on the other hand, once she could find the right timing had no problem closing the match and giving no hope to the Bulgarian, who seemed to accept her destiny and soon gave up fighting. Probably the biggest surprise of the day and a really pleasant one. Svetlana didn't play bad at all, but Halep looked the best I've ever seen her playing, being really consistent and yet able to be aggressive and hit winners whenever she had the chance. Kuznetsova didn't enjoy a good service day, but soon she had to ask too much out of it, since Simona was stepping inside the court from the return and winning almost every rally. Svetlana's serve stats then obviously started to get worse as her risks grew higher, while on the other side of the net Halep had no problems with her own serve, beind solid and hitting even a few winners with that shot, which is probably her "worst" weapon. The Romanian looked very comfortable on the Italian clay and moved smoothly on every ball threw by the Russian, who on the other hand was struggling to read her opponents shots and was often caught on the wrong feet and "dropshotted" many times. By leaning on Sveta's shots, Halep often found great accelerations and in no time the match was over on her favor with a double 6-1. The first match of the night session was featuring two players with a great gap age-wise, since Italian only slam champion Francesca Schiavone is 11 years older than the Dutch player. Sadly for her and the home crowd, experience wasn' enough for her to get through this match, despite her will and pride, Schiavone never really looked in control of the match and her game was not enjoying a good day. 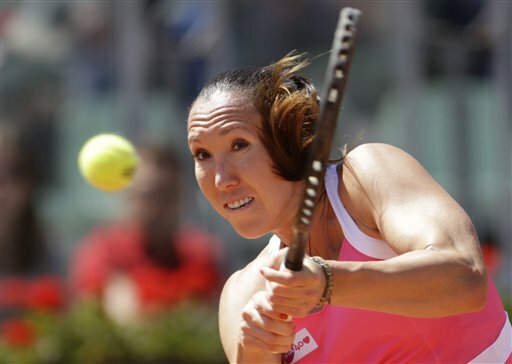 Despite coming from the victory in Marrakesh, Schiavone looked as if she had problems adjusting to the court's speed and bounces, but at first it was not that clear, since Kiki was missing too much as she gifted away at least 10 of the first 15 points with errors. The Italian couldn't capitalise the advantage and soon got broken back and drawn to a set where every point needed to be fought for, even though the quality wasn't often involved in the making. Only a tie-break could close this first set and Bertens played slightly better there, while Schiavone was too inconsistent and in the end had to surrender to Bertens's powerful strokes 7 points to 5. Everything happened really fast from then onwards, Bertens finally looked steady and whether in the first set she gifted many points with silly errors, in the second she didn't allow any of that to happen, whilst Schiavone completely lost the plot and in the end couldn't really do much to prevent Bertens from winning it. 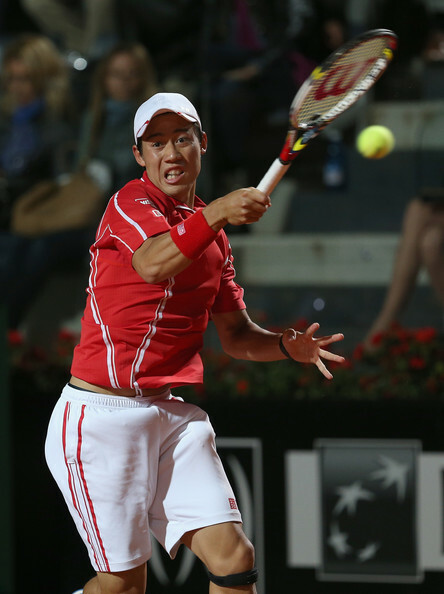 Coming from a good week in Madrid, where he defeated Roger Federer en-route, Kei Nishikori probably had not much time to adjust to Rome's different courts and you could see that from the first points against Local Wild Card Lorenzi. The cold night had slowed down the courts and the Japanese struggled to produce winners as easily as in Madrid, but that didn't hurt the gap between the two players. Despite looking a little rusty and often missing shots that he shouldn't have, Nishikori never really seemed on the edge of suffering an upset, mostly because Lorenzi's only shots able to worry him were the serve and the dropshot, but the first inevitably started to suffer smaller percentages, once he tried to serve more aces, whilst the second was very hard to be tried on the heavy and deep balls of Kei. Had to leave at the end of the first set.